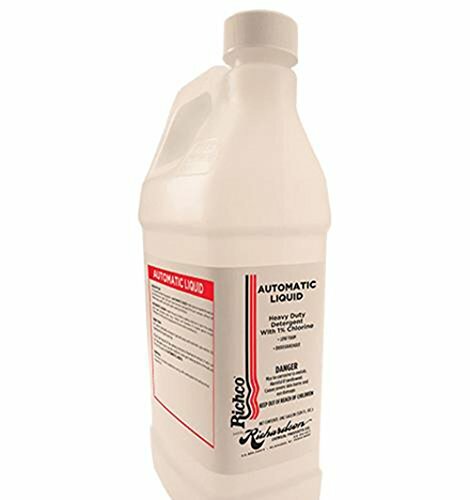 Automatic Liquid detergent features a low-foaming, biodegradable formula designed for use in carousel, conveyor and other spray-wash automatic glass washing machines. It combines a powerful blend of cleaning agents and 1% chlorine to quickly cut through soils, residue, lipstick and oils to leave glassware sparkling. It also contains special corrosion inhibitors to help prolong equipment life and reduce maintenance costs. ** Not for hand washing.  Low-foaming detergent developed for automated glass washing machines.  Powers away various soils, residue and oils to leave glassware sparkling clean. Use ½ to 1 ounce of concentrate per gallon of water in the wash tank. Hard water may require additional detergent. POWERS AWAY various soils, residue and oils to leave glassware sparkling clean.